Cook the dry rice noodle in boiled water for about 5 minutes, and then rinse it twice with cold tap water and put it aside. It will become dry naturally. Take one piece of rice paper, dip it in the warm water. Make sure every part is wet with the warm water. Placer the rice paper in a tray or cutting board. The water will evaporate and become dry. Take the lettuce leave on the low part of the rice paper, and take a piece of vegan ham, some rice noodles, some carrots, and cucumber. Put some peppermint leaves (2 or 3 are enough), and cilantro. Put two vegan shrimps or tofu. Roll the rice paper very tightly. Hold the whole thing tightly. Don’t put too many ingredients otherwise the roll will be too big. The roll can be eaten like that but also nice to cut it into four parts. 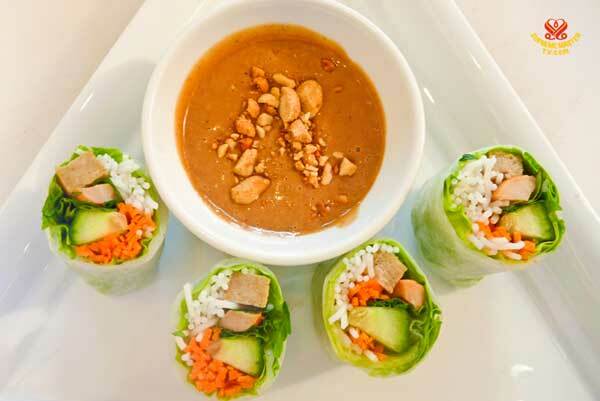 The roll can also be eaten with peanut sauce. Mix about 1 tablespoon of peanut butter with 1 tablespoon of hoisin sauce and some seasoning powder. Add some coconut milk with some water and orange juice, and add this into the peanut butter. Mix thoroughly and ready to be eaten. Chop the fresh lemongrass very fine and mix it with 1 teaspoon of salt, 1 teaspoon of vegetable seasoning, ½ teaspoon of chili flakes. Take a big piece of tofu, put it in a pot of salty water to cook it around 15 minutes to make the tofu more tasty. Take out the tofu, press out the water, and cut the tofu thick about 15 milimeters. Dry the tofu a little bit with paper towel. Make some grooves on both sides of the tofu. Put some of the lemongrass mixture inside its grooves. Put the tofu in a fridge overnight, or 12 hours at least. After that, fry the tofu in medium heat in vegetable oil. Just use very thin layer of oil so the tofu will be golden brown on both sides. The tofu is ready to be served.